Magnificent carved and stained dolls depict icons of the Virgin Mary & Jesus and four saints, all soulful and distinct. 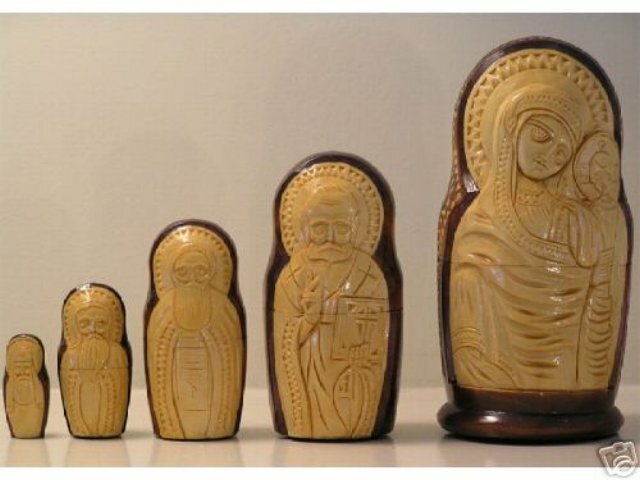 A band of interesting hand-carving outlines the icon of Mary holding the Christ Child (or "Kazanskaya”) on the largest doll. Also, a large, simple cross is carved in the back of the largest doll. Saints adorn the other four dolls. Artist’s signature carved on the bottom. This set was collected in the early 1990s. It was obtained in Moscow, near Red Square, from a museum/art school specializing in Russian religious art.